German painter and illuminator. He was a leading painter in Munich of religious compositions, manuscript illuminations and portraits. He studied with his father, Wolfgang Mielich, a Munich municipal painter, who appears in the Munich tax records from 1509 onwards, but the years 1536-39, spent with Albrecht Altdorfer in Regensburg, were decisive for Hans Mielich s approach to colour. In 1536 he illuminated the title-page to the Freiheitenbuch of the city of Regensburg (Regensburg, Stadtmuseum). In 1541 Mielich travelled to Rome on a commission from Duke William IV of Bavaria. He stayed there until 1543, when he became a master in Munich. 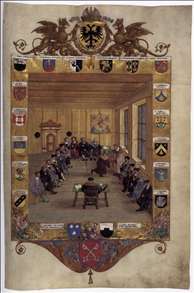 From 1545 onwards Duke Albert V of Bavaria helped him obtain commissions, and in 1558 Mielich became leader of the Munich painters guild. He consistently signed his works with the monogram HM (=M in H). 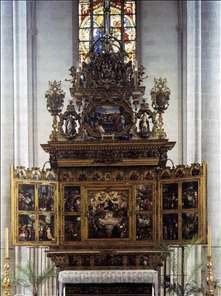 See more details about "High Altar"
See more details about "Meeting of the Regensburg Council"